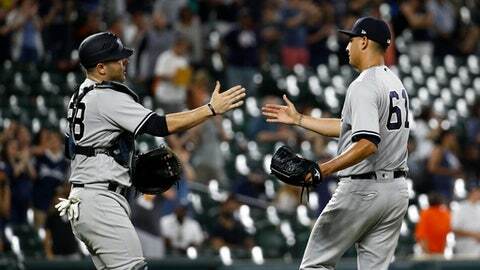 BALTIMORE (AP) Brett Gardner had four hits, homered and drove in three runs to help the New York Yankees beat the Baltimore Orioles 10-2 Monday night for a doubleheader split. The split left the Yankees a 4-4 record against Baltimore and dropped them 2 games behind first-place Boston in the AL East. The first game ended with Gardner grounding out as a pinch hitter with the potential tying run on third base. He returned in the nightcap to torment the Orioles at the plate and in center field, where he made several fine, running catches. Gardner led off with a single off Jefry Ramirez (0-3) and scored on a double by Didi Gregorius. In the fourth, Gardner hit his seventh homer, a two-run drive that made it 3-0. BOSTON (AP) – J.D. Martinez hit his major league-leading 28th home run, Steve Pearce added a two-run shot and Eduardo Rodriguez pitched 5 2/3 innings to lead the Red Sox to a victory over the Rangers and their seventh straight win. Mike Minor (6-5) allowed two runs on six hits. SAN DIEGO (AP) – Clayton Kershaw pitched six shutout innings, and Cody Bellinger and Justin Turner each had three hits as Los Angeles Dodgers beat San Diego. SAN FRANCISCO (AP) – Pablo Sandoval singled home the winning run with one out in the bottom of the 11th inning a day after driving in five runs, sending San Francisco over Chicago. CLEVELAND (AP) – Anthony DeSclafani allowed one run in seven innings, Scott Schebler was 4 for 5 with a homer, and the Cincinnati Reds defeated the Cleveland Indians 7-5 on Monday night. DeSclafani (4-1) held the Indians to five hits. Votto hit a fifth-inning home run off Mike Clevinger (7-4), who matched a career high with 11 strikeouts in six-plus innings. ST. PETERSBURG, Fla. (AP) – Daniel Robertson hit an RBI single in the 10th inning and the Rays won for the 12th time in their last 13 home games by beating the Tigers. MINNEAPOLIS (AP) – Eduardo Escobar had three hits and drove in the go-ahead run in the seventh to support Jose Berrios‘ strong outing as the Twins beat the Royals. HOUSTON (AP) – Frankie Montas and two relievers combined for a five-hitter, Stephen Piscotty homered and hit an RBI single and the Athletics beat the Astros. PITTSBURGH (AP) – Gregory Polanco drove in four runs in the first two innings and the Pirates went on to a victory over the Nationals. Jefry Rodriguez (0-1) took 90 pitches to get through five innings, and was charged with all six runs. MIAMI (AP) – Backup catcher Bryan Holaday hit a walk-off RBI single with one out in the 10th inning and the Marlins beat the Brewers. Holaday, who came into the game batting .165, was in the lineup because the Marlins placed All-Star catcher J.T. Realmuto on the paternity list before the game in anticipation of the birth of his first child. Miguel Rojas was hit by a pitch from Corey Knebel (2-1) with one out in the 10th, Cameron Maybin walked, and both advanced on a double steal. Holaday then bounced a grounder up the middle against the drawn-in infield. The Brewers had runners at second and third with none out in the 10th, but Brad Ziegler (1-5) struck out Aguilar, and after an intentional walk, Brad Miller bounced into a double play. NEW YORK (AP) – Aaron Nola allowed one hit in seven shutout innings and lashed a three-run double that sent the Philadelphia Phillies past the New York Mets 3-1 on Monday for a split of their twinight doubleheader. Mets rookie starter Corey Oswalt (0-2) took the loss. In the opener, Wilmer Flores connected for a pinch-hit homer in the bottom of the 10th off Victor Arano (1-1) to give New York a 4-3 victory. Tim Peterson (2-1) pitched out of trouble in the 10th to get the win.